Hello friends! 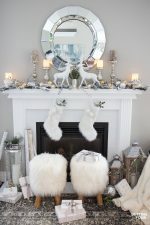 Today I’m sharing my Elegant and Neutral Christmas Foyer – come see the new gorgeous mirrors I added to our foyer and the birch accents! Get lots of holiday decor ideas with 25 home tours – all home tour links are listed at the bottom of the post! I hung two gorgeous preserved boxwood wreaths on the french door to my office. I love green colored accents and natural greenery! Boxwood wreaths are so elegant I think. Decor tip: I used suction cup hooks that can be used on glass to hang the wreaths- they work really well since the wreaths are hefty in weight and they stay up all of December without falling down…. even when I open and close the door! 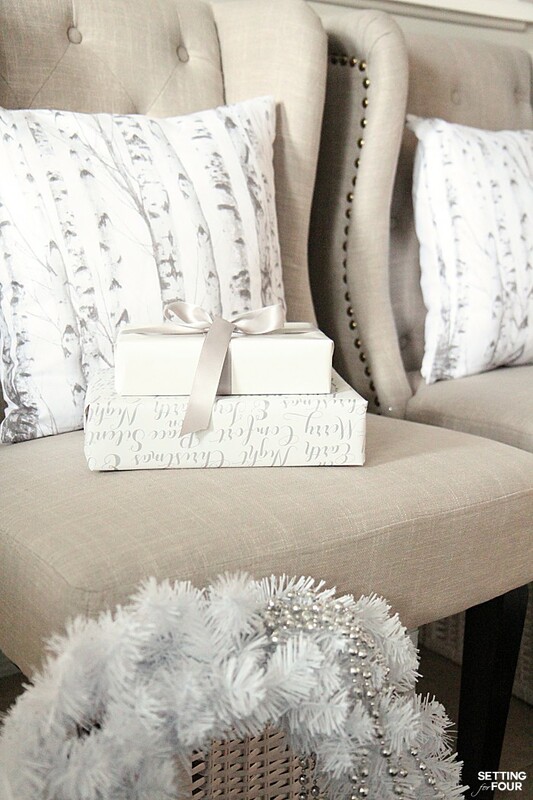 I added two beautiful birch forest pillows in shades of gray and white – they look like the birch trees in the woods behind our home! I think they look so pretty with the birch branches in the tall vases that I keep in the foyer year round! Decor tip: If you have a small foyer or no foyer at all think about adding a vase of branches like this – it doesn’t take up much space! 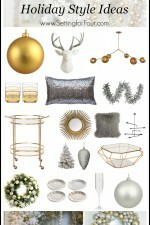 I set out a bowl of silver and gold sparkly, metallic Christmas balls – love their elegant shimmer and shine! …and hung a branch that fell off a tree in our backyard last year…which I spray painted with my favorite metallic silver spray paint! I also hung a few metallic Christmas balls from it using clear fishing line. Next I filled my silver lanterns with mini silver and gold Christmas balls – the flameless candles are on timers so when the sun sets they come on and give off a gorgeous glow against the sparkly Christmas balls. The last thing I did was hang 6 gorgeous sunburst mirrors which I picked up at HomeGoods/HomeSense. You can find similar ones here. Decor tip: I used these velcro hanging strips to hang these mirrors – no nails required! I hope you like my elegant and neutral Christmas foyer! 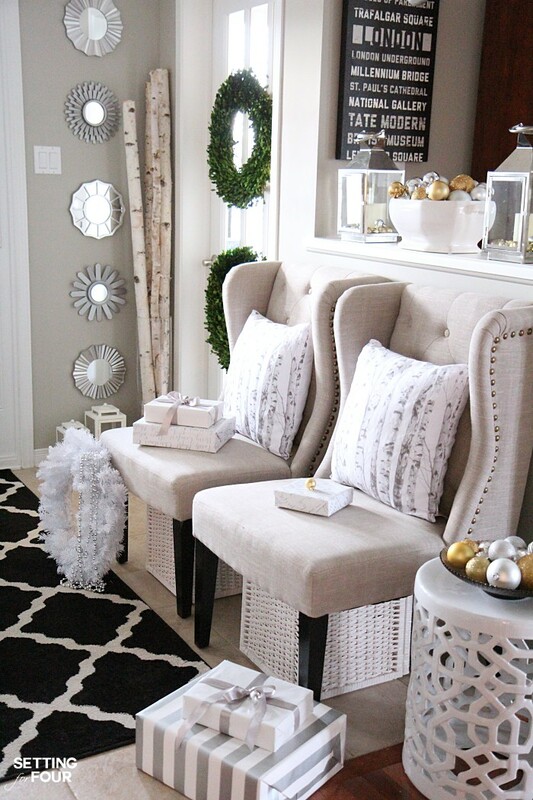 SHOP THE LOOK OF MY HOLIDAY FOYER! Click on any image to be taken directly to the product you are interested in learning more about! 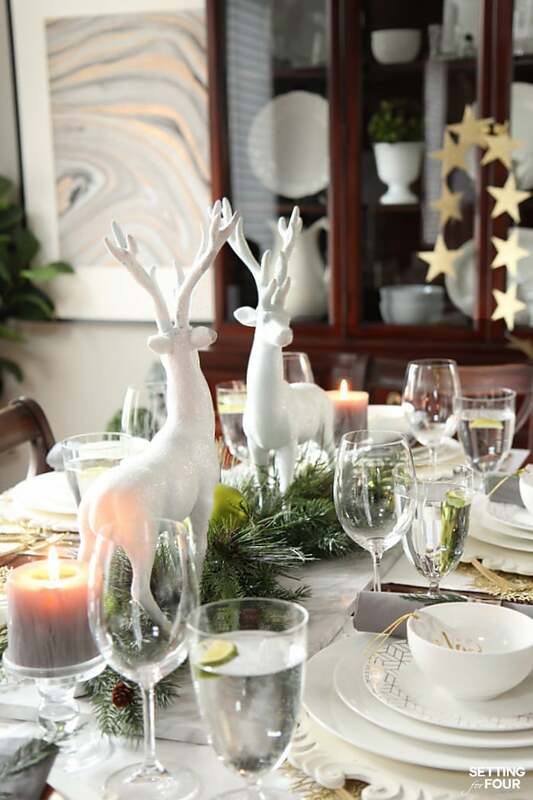 Don’t miss my other Christmas Decorating Ideas! 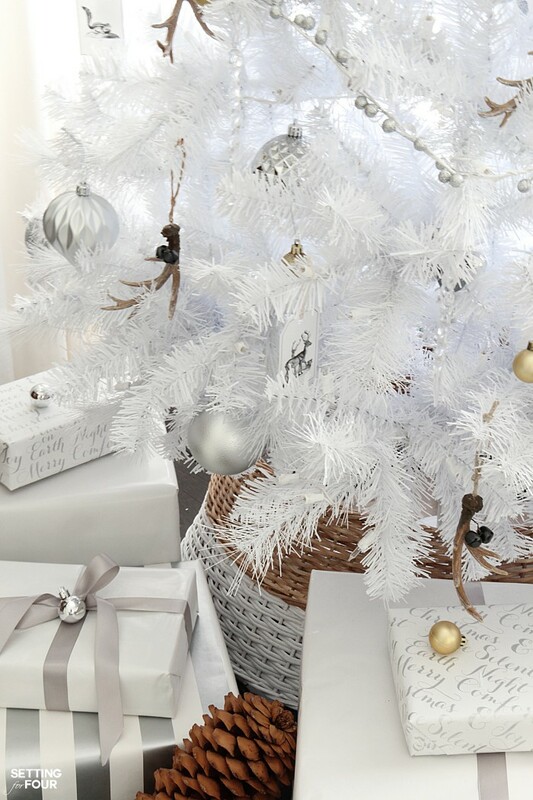 my White Christmas Tree – Rustic Glam Style! 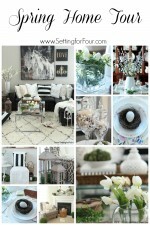 Please visit these bloggers gorgeous holiday homes! Beautiful Heather! Love your palette and entry. So elegant! I love that’s it’s neutral but it says Christmas! and make your friends and family feel very welcomed. Your foyer sets the tone for your most beautiful home. Love all of the details of the holiday season!!! Merry Christmas! You are Amazing it does matter what you post you do it with Class! I so enjoy reading every post I receive. 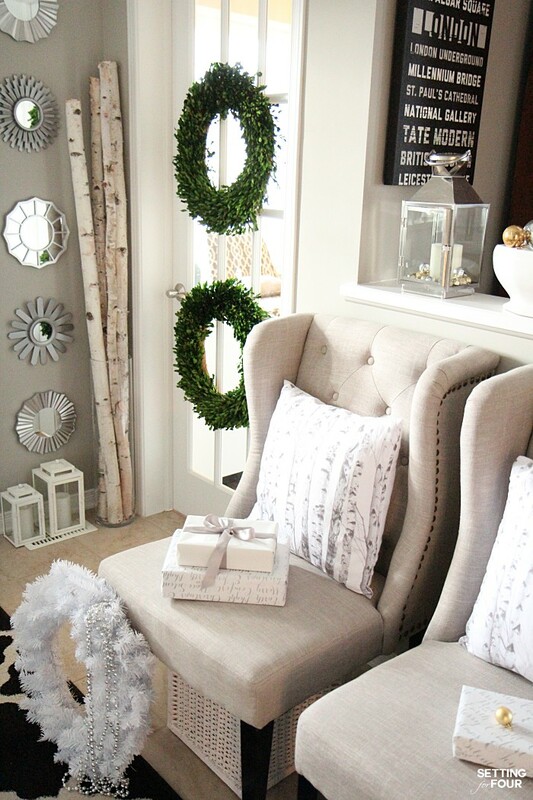 Love the birch theme Heather and those mirrors add such a lovely texture. What a lovely festive entrance! Merry Christmas. Absolutely gorgeous Heather!! 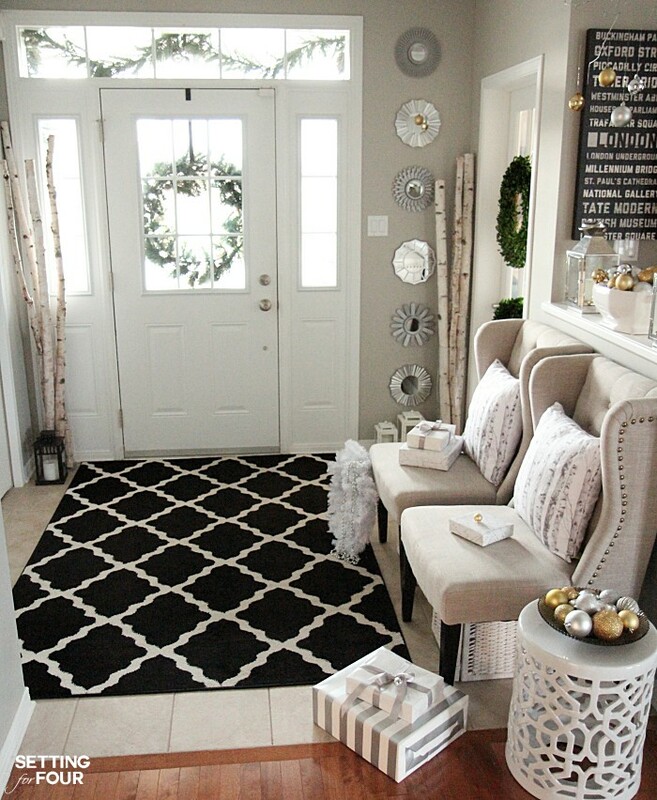 I love how inviting your foyer is. Each guest arriving will feel so special entering your beautiful home! Love your use of birch poles. Gorgeous! And inspiring! I want to try my hand at my boring foyer now! 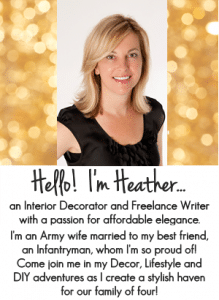 Heather, those chairs are just gorgeous and look amazing with all the bark and branch touches! Love the neutral look here!! Oh those chairs (not available right now) those little mirrors!! Those birch logs! Oh my, YUMMY!!! Such an inviting entry. I love the way your foyer came out. The colors work so well together and are just so inviting. And your wreathes look gorgeous on your door! Love, love, love the foyer decor! 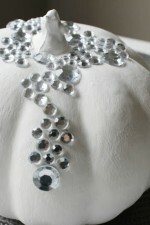 I love the understated beauty of it–just my style! 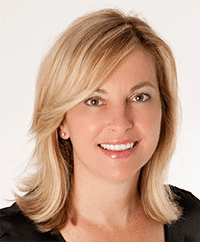 you always do elegant so well in your home tours Heather. Hope you enjoy the holiday season! Dont count me in as I am overseas! Heather, your home and decorations for Christmas are just gorgeous! So fun being on this tour with you! 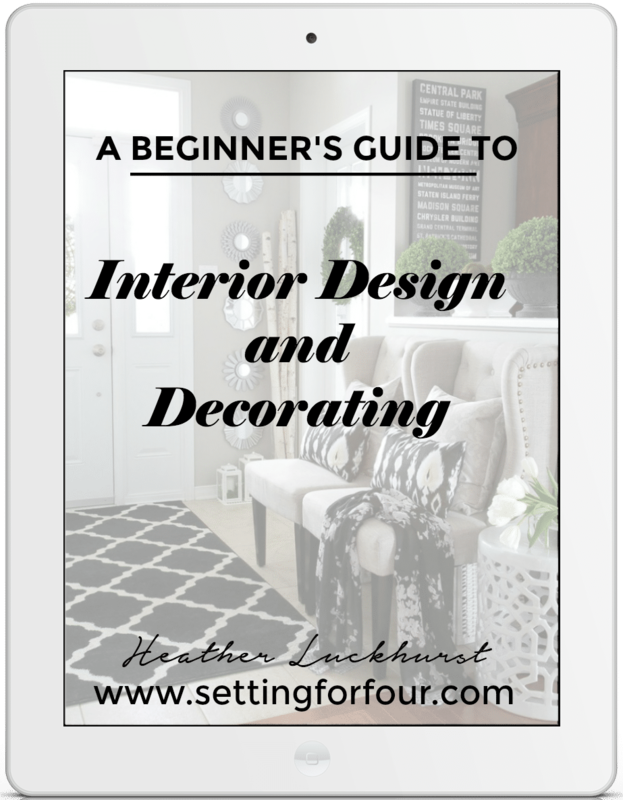 I love how you included so many design tips for your readers. The suction cup idea is genius! That is so charming! My first thought for applying your principals to my homes is “gosh how would I keep that clean?’. Then I realized that I could do many of the same details and just leave the wooden bench that i have instead of your chairs. I love you foyer ideas…especially the chairs! Thanks for sharing!